set value, the controller shall start the circulation pump automatically. 2) The circulation pump makes heat-conducting liquid circulate automatically. 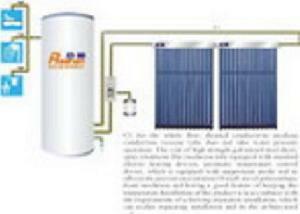 3) The heat-conducting liquid transfers heat to water by heat exchanger in the water tank. 4) In case the temperature of the water tank does not reach Tmax, then start the auxiliary heating device. 5) If discrepant temperature of the collector and the water tank does not reach theset value, the circulation pump shallbeshutautomatically. 1) Collector separates with the storage tank. The tank can be put anywhere of the house. 2) And the collector can be put on both tilted roof and flat roof. 3) Module design, arbitrary combination, harmony with the building perfectly. 4) Intelligent control and automatic operation. 5) Anti-freeze: No water inside the tubes when it works. 6) The system controller has the anti-freezing function is that the temperature circulation will operate while it reaches the fixed temperature. 7) Multifunction: Bathing, washing, domestic heating. 8) Workable at anytime and enjoyable.